Our new panniers arrived and Dave spent part of yesterday fitting them to our bikes. Our old panniers are too worn and tired for a long trip across the US. 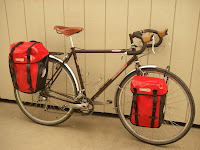 The new panniers are from Ortlieb and we are very impressed with the quality of construction and material. We can hardly wait to load them up and take them for a shakedown tour. Our touring bikes are made by Bruce Gordon of Petaluma, Ca. and we are very pleased with them. Shortly after getting our new bikes we took them for a tour to Big Sur, Ca. We arrived at the Big Sur campground feeling much fresher than we expected. We think this is at least partly due to the bikes being so well fitted to us. Our other major piece of equipment is a Burley trailer for our companion, Jack. More on Jack in another post, but suffice to say that Jack bonded with his trailer and will be happy with it as his home on our big trip. The bikes and gear looks great! Got a rain cover for the B17? Thanks, yes I've got the rain cover.